October 14, 2009, Washington, D.C. — The Federal Aviation Administration (FAA) has proposed a $5.4 million civil penalty against US Airways, Inc. for allegedly operating eight aircraft on a total of 1,647 flights from October 2008 to January 2009 while not in compliance with certain Airworthiness Directives (ADs) or the airline’s maintenance program. ADs are rules issued by the FAA when an unsafe condition exists on a type of aircraft, and additional maintenance is required to remedy the problem. Each year the FAA issues about 250 ADs requiring air carriers to correct potentially unsafe conditions. Compliance deadlines range from immediate action before further flight, to days, months, or years depending on the severity and complexity of the safety issue. Air carriers must fully comply with all of these legally enforceable directives. 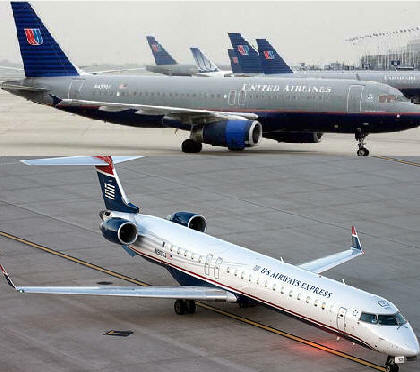 The FAA found the following AD non-compliance issues: US Airways, Inc. operated one Embraer 190 aircraft on 19 flights from October 22, 2008 to October 26, 2008 while the aircraft was not in compliance with an AD that required inspections to prevent a cargo door from opening during flight. The airline failed to perform inspections required by an AD for cracking of a landing gear part on one Airbus A320. The airline operated the aircraft on 26 flights from November 2, 2008 to January 20, 2009 while not in compliance with the AD. The airline also operated another A320 for 17 flights from December 3, 2008 to January 21, 2009 while not in compliance with the same AD. The FAA has also proposed a $3.8 million civil penalty against United Airlines for allegedly operating one of its Boeing 737 aircraft on more than 200 flights after the carrier had violated its own maintenance procedures on one of the plane’s engines. On April 28, 2008, a United 737 returned to Denver after shutting down an engine due to low oil pressure indications. During teardown of the engine a week later, United mechanics found that two shop towels, instead of required protective caps, had been used to cover openings in the oil sump area when maintenance was done in December 2007. As a result of United’s failure to follow its maintenance procedures, between February 10 and April 28, 2008 it flew the aircraft on more than 200 revenue flights when it was not in an airworthy condition. United’s maintenance procedures specifically require use of protective caps or covers on all components that could be adversely affected by entry of foreign materials. United has 30 days from the receipt of the civil penalty letter to respond to the FAA.